Welcome to the Month Without a Dirty House challenge! Follow along with my experiences and feel free to contribute your own in the comments below. Day 29: You Did It! Congratulations on completing the Month Without a Dirty House challenge. If you stuck with us for the entire 29 days, you learned how to become strategic with your cleaning, tackle grime with pro tips from Molly Maid, keep your homes tidy when you have children and pets, and know which cleaning products work best. It’s been an exciting month, and I hope we can all use these skills to continue toward a tidy life. If you liked the Month Without a Dirty House challenge, be sure to sign up for the March Your Way to Fitness challenge, which is being hosted by our very own Victoria Araj. In the month of March, follow her as she gives advice for getting fit and eating healthy. Also, check out our final reviews and updates for the Month Without a Dirty House. I’m not trying to brag or anything, but I feel like I’ve got this cleaning thing down pat. With the help of Evan Zislis and Marie Kondo, I’ve finally gotten a knack for organization. I still have a few things I’m working on (I don’t think I’ll ever want to make my bed), but I’m definitely headed in the right direction. More than anything else, this month has taught me that cleaning shouldn’t be treated like a chore. It needs to be a habit, like brushing your teeth. Cleaning doesn’t exhaust me anymore. If anything, I feel better when the house is clean. And it only takes a few minutes a night. Seriously, if I can do it, anybody can do it. Benedict Cumbercat is basically a genius. He now aims for the hole every time, and we rarely have to worry about a mess. We’re still on level three of the program, but I think he’ll be done with the training seat by the end of March. Butler Products provided us with some of their cleaning tools to test out during the Month Without a Dirty House challenge. We want to highlight some of our favorites. It’s amazing how handy such a simple product can be. Before we started using this hamper, Devri and I were just throwing our dirty clothes in the corner behind our door (not recommended). And when the pile grew to a certain height, we lugged everything to the laundry room. It was a messy system. 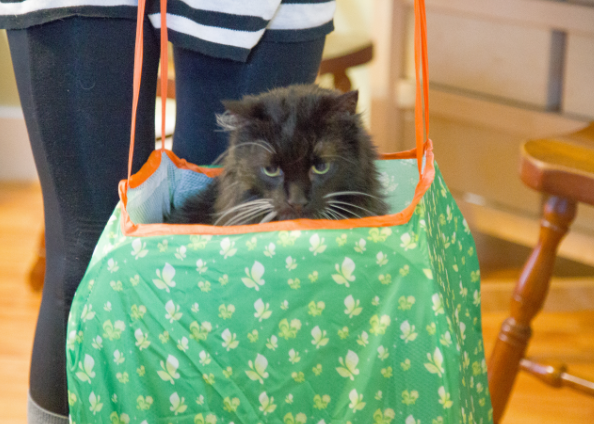 We’ve been using the pop-up hamper for the last several weeks, and the fact that it folds down means it can be easily stored. As we learned from Marie Kondo, it’s essential that we have a place for each of our things, and this includes cleaning products. The ReadyMop has been a great selection for my kitchen and living room. 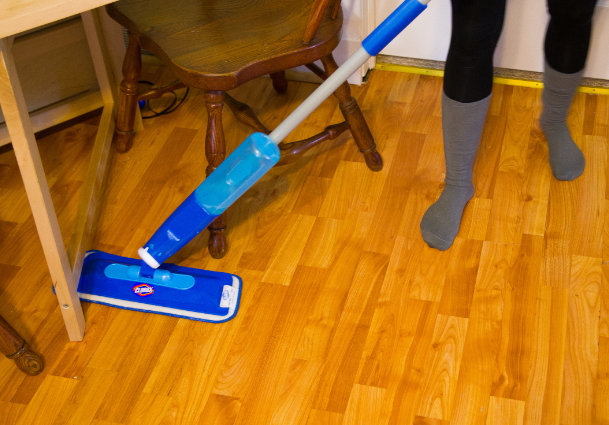 It gives you the option to spritz your floor as you mop, allowing you to better knock out the muck that’s been building up. My wife and I have been using a bleach/water mix in the container. One of our Zing readers recommended using lemon-scented Scrubbing Bubbles for the floor; she said it worked well and left the floor smelling great. We’re trying that this week. 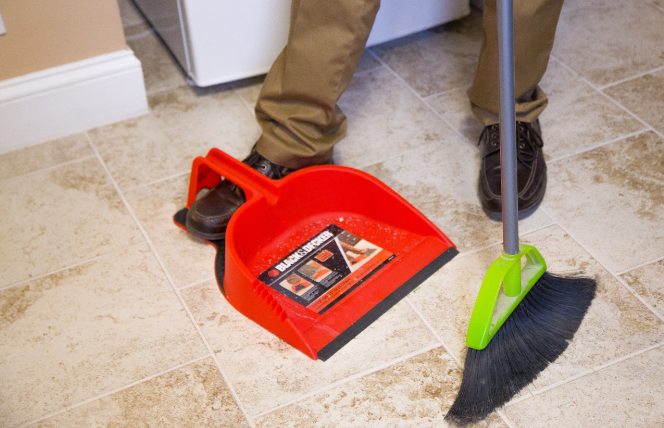 The ReadyMop also has a handy rubber grip, which is nice when you’re aggressively scrubbing at certain spots on the floor. Previous to this challenge, I rarely used my dustpan (maybe a couple times a month), so I was a little skeptical of the Step-On-It Dustpan by BLACK + DECKER. It allows you to stand up when you’re sweeping and hold the dustpan with your foot, rather than bending down to sweep up the dirt. At first, I didn’t think it would be that much of a hassle to simply bend down and sweep. Boy was I wrong. When you’re trying to keep your house consistently clean, it requires work throughout the entire week. And when you’re spending so much time doing something, you immediately look for ways to make the work more convenient and efficient. The Step-On-It Dustpan does both of those things. I can sweep dust up a little bit faster, and I don’t have to bend down every five seconds. I definitely recommend this one. Week 3: Does This Bring Me Joy? If you’ve been reading along with Marie Kondo’s book this month, you’ve probably noticed that she spends a lot of time talking about joy. She believes that clothes should either give you joy or be thrown away/donated. As per her recommendation, I went through my entire wardrobe this morning and did what I like to call the joyless purge. I already purged my house once after hearing the interview by Evan Zislis, but I never took each of the inanimate objects and asked if they brought me joy. So I went through all of my clothes, holding them and asking myself if they brought me joy. I honestly didn’t think I would find anything to throw away, but in the middle of the second drawer, I realized that there were a few things that I hadn’t worn since college and even a few things that I hadn’t worn since high school. I got rid of them first. Then I found an entire drawer dedicated to work jeans. Basically, when one pair of jeans gets old and tattered, I’d gotten in the habit of tossing them in the work jean drawer. Doing this exercise forced me to ask myself if I actually needed six pairs of hole-filled jeans. The answer is no. Obviously. Benny has made it to the second level of the CitiKitty training program. That means that we popped another ring out of his training seat. At this point, he’s starting to learn to aim for the toilet, and about one out of every three trips to the bathroom doesn’t require me to clean out the litter box. I also realized early in the challenge that I didn’t have the right kind of litter. Apparently, not all litter can be flushed down the drain. 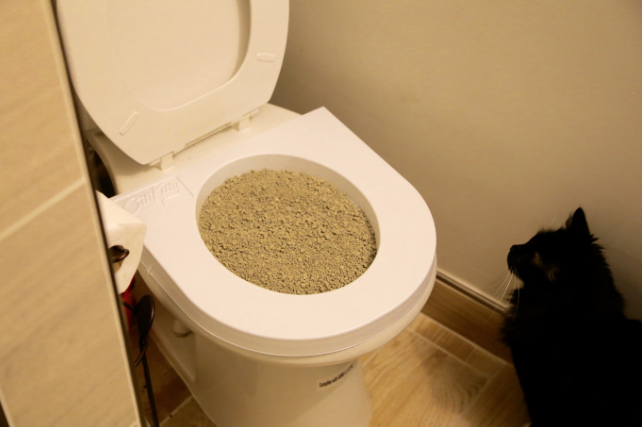 I went online and found Better Way Flushable Cat Litter. As of yet, everything is flushing fine. Week 2: How Do You Teach Your Kids About Cleanliness? This week we’re talking about ways to teach children about cleanliness. To start things off, organizational and strategies consultant Evan Zislis has given us a tip that he uses with his own daughter. To learn more about Evan Zislis, check out his website. “My workshop starts with asking kids what they think of organizing. Usually, they feel it’s just another chore Mom and Dad wants them to do, but once they realize they are responsible for their ‘space’… they start to get it. They also learn that everyone organizes differently, and there is no “right” way to organize; they need to find what works for them. Welcome to week two! Last week we learned about purging the excess stuff in our lives, getting organized and the exciting world of cleaning calendars. 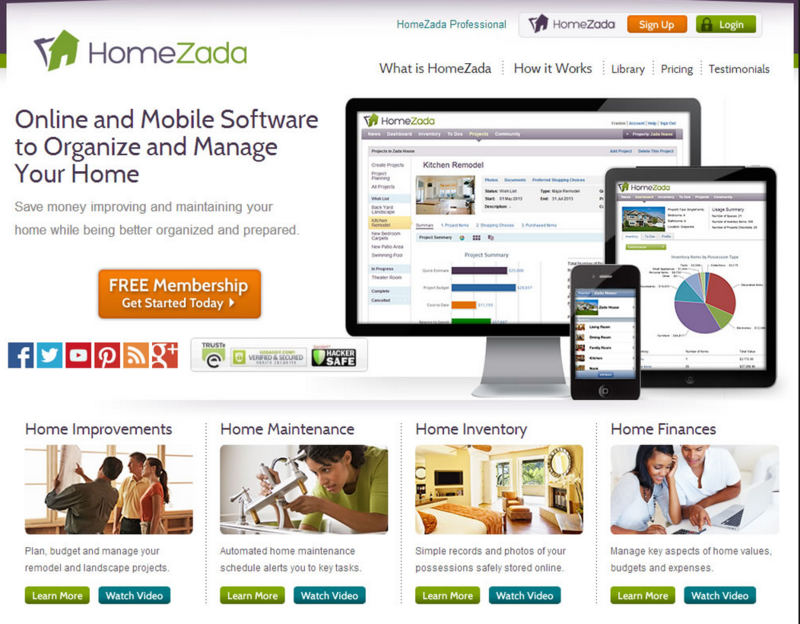 To piggyback off of that, consider trying the new home maintenance service HomeZada. This online service allows you to set up long-term reminders for maintenance and cleaning tasks around the house. This isn’t as much for the day-to-day chores as it is the less frequent projects, like replacing air filters or sharpening and cleaning the garbage disposal. These, as we all know, can be the easiest to forget. HomeZada reminds you with emails of when it’s time to get these projects done, and it also keeps track of the costs associated with your repairs. This is a great perk if you’re as forgetful as I am. And if you think about it, homes don’t come with built-in maintenance schedules, so we need something to jog our memories. Currently, my own account includes cleaning the fridge, inspecting the trim around the house, flipping the mattress and cleaning the hanging pot rack (we’ll talk more about this next week). There’s also a tab for even bigger projects. Devri and I put a new roof on our wish list, and HomeZada gave us recommendations for how to get there. Today I am purging the final stronghold: the utility room. We’ve spent the last week going through our clothes, boardgames, files and knick-knacks, but I stayed far away from the utility room. It’s a big project, and I need more than a few hours to get it done. We’re about finished clearing it out, throwing away a few things and storing others in the attic. We want the utility room to be specifically for our cleaning products, and it’s starting to come together. I’m having a hard time containing myself from organizing it all. Maybe it’s human nature, but when I see an empty spot, I immediately want to fill it with something. All in all, the purge went pretty well; there were no major struggles during the process. Well, Devri and I did spend a few minutes debating if we should keep a lamp or not. We found it in the closet next to the water heater. Devri was for it. I wanted to throw it in the trash. It’s now – of course – sitting next to the bed. Now that our house is actually clean, Devri and I are determined to keep it that way. We turned to Becky Rapinchuk, founder of the hit blog Clean Mama, for support. She recommended one of her free cleaning calendars, which helps you keep the dirt at bay with only 15-30 minutes of housework a day. That sounds doable to me, so tonight we’re washing floors, wiping counters, taking care of the clutter and doing the laundry. Benny is making big strides in the potty-training department. We’re using a product called CitiKitty, which was created by entrepreneur and Shark Tank survivor Rebecca Rescate. 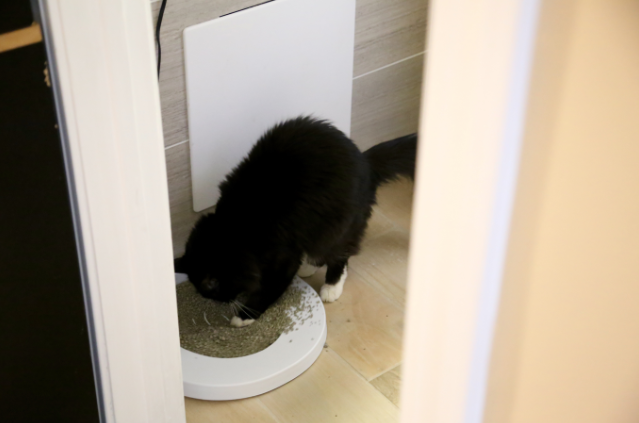 CitiKitty is a litter box insert that sits on top of an open toilet. As your cat becomes comfortable using CitiKitty, you remove the smallest ring at the center of the training seat. And as the weeks progress, you remove more rings, causing the cat to eventually dispose of their waste in the water, rather than in the litter. Benny’s skeptical about the program. We tried putting the training seat on top of the toilet on Tuesday, and he immediately did his business on the floor (we can only assume this was an open act of protest). In response, we placed the training insert on the ground for a day. He howled at the insert a few times, but in the end, accepted it as a litter box. It was a good compromise. It’s amazing how quickly our homes can shift from clean to dirty. When I woke up this morning, I expected my house to be in the same shape that I left it in the night before. What I did not expect was the cat to overturn his litter box and proceed to carefully spread its contents around the bathroom floor. He also managed to drag his water bowl – from the hallway – into the bathroom, tip it over and then mix it with his litter. We moved Benny’s box to the bathroom to get him accustomed to the new space; tonight we’re starting the first phase of the CitiKitty training program, so he’ll be doing his business alongside us from now on. But at the moment, it doesn’t look like Benny’s on board. Besides sweeping and scrubbing the bathroom floors, my morning went pretty well. I woke up an extra hour early today to cook breakfast for the week. I’ve started making several days worth of breakfasts – usually some kind of sausage, egg and pepper wrap – on Monday mornings. This way, I only have to clean up the breakfast dishes once during the week (that’s six whole days of morning dishes I don’t have to worry about). My wife and I learned pretty quickly that a dirty house starts in the kitchen, so we wanted to minimize the skillets and pans in the sink. Today we’re also talking to Evan Zislis, author of “ClutterFree Revolution,” about how to get organized and find the desire to clean. Take a look at his interview now. In February, we’re challenging you to go the entire month without a dirty house. That’s right. We’re asking you to get organized, keep the clutter at bay and above all else, free yourself from filth. As I’m writing this, there are dishes waiting in my sink at home. Dirty dishes. They’ve been there since last night – just hanging out – and when I get home this evening, I’ll definitely think about probably cleaning them. Maybe. At least by the end of the week. But it’s really too soon to make such promises. My name is Patrick Chism, and I’m currently a clean poser. I clean when things start to smell; I clean when I’ve lost something in my house; and I clean when my mother-in-law comes to town. I’ve never made cleanliness a part of my day-to-day, and it’s time to make a change. Whether you’re simply untidy or begrudgingly grimy, join us as we spend the month of February without a dirty house. I need to make some serious changes, and I’m guessing you do too. Sign up now! Shake the dirt off your life and get to cleaning in a Month Without a Dirty House. I’ll keep you honest with emails throughout the month, and you can read along as I chronicle my own experiences on the Zing Blog. 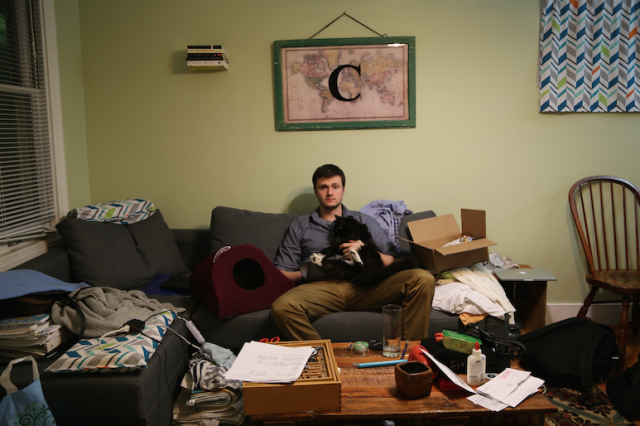 Organization and time management –I feel like I never have time/desire to clean my house. Deep cleaning – what is it and how often do I have to do it? Cleaning Products – Do I need more than a broom and a wet wipe? 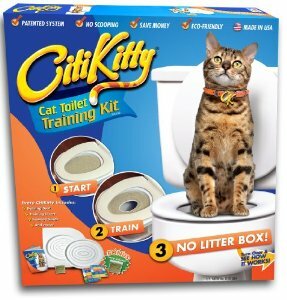 CitiKitty – I’m training my cat to use the toilet because litter boxes are gross. During the challenge, we’re going to arm ourselves with advice from some of the nation’s cleanest experts. We have professional cleaners, organization consultants, entrepreneurs and product reviews lined up to help you get through the month without a dirty house. I’m also going to read Marie Kondo’s book “The Life-Changing Magic of Tidying,” during the month, using her words of wisdom to keep me on track. This challenge is only one month long, but I’m hoping the effects will last well beyond that. Feel free to join me! In one of your emails it stated to leave a comment on products found to be helpful at home. I have found Lemon scented scrubbing bubbles in the spray can to be super on cleaning kitchen floors. Shake the can, spray it on and wait a few seconds for it to get to the dirt and damp mop it away, rinse mop and repeat. Leaves the kitchen smelling great too. I’ll have to try that, Denise. We’ve been scrubbing the floors with a bleach/water mix, but the smell is a little overwhelming. Thanks for the tip. I’ll give it a try this weekend and get back to you. I have decided to participate in an effort to keep up with several tasks I have already started. I have twin boys that went off to college this year (keeping the house much more manageable) and next year they are planning to stay in an apartment. 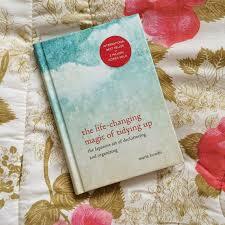 I began de-cluttering kitchen cabinets and putting aside all items I believe they can use. I have a tendency to start tasks, then take too much time to finish sorting and packing, creating an eye sore of a mess. This will challenge me to move quicker and keep the clutter clear! First of all, I commend you for keeping up with twins. And it sounds like you’re off to a good start. I’m reading Marie Kondo’s book, “The Life-Changing Magic of Tidying” this month, which is all about keeping our homes consistently clean. For me personally, consistency has always been the problem. If you’re up for it, pick up the book and read it with us during the month. A bit more of a challenge for us this month as we are in the midst of home repairs from a water leak. Moved all 3 kids into 1 room, furniture and dressers stacked in the living room, etc. The positive: cleaning out the kids’ rooms helped us find all the papers and broken toys they’ve been hoarding and remove them. Plus we are potty training a puppy. Should be interesting! It sounds like you’ve got a full plate, Trish, but I’m glad you’re looking at the positive. This week, we’re actually talking about purging the things we don’t actually need, so I’m excited you brought up the hoarded toys. My wife and I don’t have kids of our own yet, but I’ve always wondered how to keep little ones organized. If you have any pointers for our group, I’d love to hear them.